Question: Should I convert from a “C” corporation to an “S” corporation now that I am ready to sell? An eleventh hour conversion from a “C” corporation to an “S” corporation will not work to avoid the double tax (tax at the corporate level and tax upon distribution to the shareholders) associated with an asset sale of a “C” corporation. Conversion to an “S” corporation will only provide for avoidance of the double tax on the amount of appreciation in value from the date of the “S” election. Question: What are the consequences of selling assets instead of stock in an “S” corporation? Buyers may prefer an asset sale because unwanted and unknown liabilities can be avoided by Buyer and Buyer obtains a cost basis in the assets equal to the purchase price. Generally an asset sale works well for the seller of an “S” corporation as well since the gain on the sale passes through directly to the shareholders. There are some additional taxes, however, that will apply in the sale of “S” corporation assets (v. sale of stock) which include; (i) 1.5% California income tax; (ii) “C” corporation income tax of up to 35% on gain attributable to the value of the corporation prior to conversion to an “S” corporation (if the “S” corporation conversion was made more than 10 years ago then there will be no “C” corporation tax); (iii) possible investment tax credit recapture if assets are sold prior to end of the applicable recovery period used to calculate the original investment tax credit; (iv) sales tax on value attributable to furniture, fixtures and equipment; and (v) if that portion of the purchase price allocated to depreciable assets is greater than their tax basis, the difference will be taxed at ordinary income rates instead of capital gains rates. Question: I am buying a business and want to know if I should accept the Seller’s offer to prepare the purchase agreements? Only accept this offer when pigs can fly. In other words, unless pigs have made some aviation advances that I am not aware of, the Buyer should never have the Seller prepare the acquisition documents. Sellers would be happy with a one-page bill of sale and payment in cash, but Buyers should have agreements that contain adequate detail, disclosure and provisions along with representations and warranties to protect their interests. If you think, as the Buyer, that having the Seller prepare the agreements will save you money, you will generally find the opposite to be true. It takes more time and cost to fix a bad agreement than to start with the right agreement. Question: How important are the purchase agreement schedules/exhibits to a transaction? Schedules and exhibits to the purchase agreement are an integral part of the total agreement. Post-closing problems that may arise in the sale of a business would generally arise out of information (misinformation) included on the schedules or in the exhibits. The schedules usually arise out of the representations and warranties in the agreement. Each of the representations and warranties should be read very carefully and the information to be set forth on a schedule should be accurate and complete in all material respects. The Seller always needs to understand that even if the Buyer knows that something is not correct or has knowledge of a certain fact, that knowledge will not in any way mitigate Seller’s liability for a breach of the agreement or misrepresentations contained in a representation and warranty. Question: If I already have corporate counsel, why should I hire a lawyer who specializes in mergers and acquisitions to advise me in the sale of my company? If you are comfortable with a heart surgeon (who is probably a very bright and capable surgeon) performing your brain surgery, then you should stay with corporate counsel to complete your merger and acquisition. Question: Is a commission payable on the real property lease as part of the sale of my business? It is a important when entering into an agreement with an investment banker/business broker to carefully review that agreement to determine what items will be subject to payment of commission. Generally, any real property transactions in the context of a business sale are not subject to a commission. Question: How can I find a business to acquire? The best place to start is by contacting those parties engaged in the investment banking and business brokerage business. Other potential resources would include attorneys like myself who specialize in mergers and acquisitions, your CPA and your banker. There also are firms that specialize in representing Buyers. Question: As a Seller, should I employ a business intermediary (broker/investment banker) to help me if I already have one or more offers or expressions of interest from potential Buyers? While there are exceptions, I would always recommend that a business broker/investment banker be employed to assist in the sale of a business. It may turn out that the one or two prospective purchasers that have contacted you may not follow through on their expression of interest or may turn out not to be qualified to purchase your company. If you put all of your eggs in their basket, you may end up with an empty basket with nowhere to turn if you do not have someone looking for other potential Buyers that could be added to the mix. In addition, a good business broker can add value both by providing other potential buyers and by advising Seller in the actual negotiations of the transaction. Question: Should I establish a charitable remainder trust before the sale of my business? A charitable remainder trust can be established for the donation of stock to a charity. The charity sells the stock and does not have to pay any tax on the sale. Therefore, all of the proceeds can be invested. Seller retains a lifetime interest on earnings on those proceeds (which can be structured in various ways) which may generate more income to the Seller than if the Seller had retained the stock, sold it, paid the tax and invested the after-tax proceeds. Charitable remainder trusts can be very beneficial to the Seller in some situations and, obviously, is a benefit to the charity. The key, however, is that a charitable remainder trust needs to be established before the execution of a letter of intent. Many times, charitable remainder trusts are not used by Sellers because Sellers are reluctant to contribute their stock to a charity without the assurance that the stock will be sold. The time to investigate a charitable remainder trust is when you are thinking about selling your business, not after you have already started the sales process. Question: When is a covenant not to compete enforceable in California? Though there are very limited exceptions, California will only enforce a covenant not to compete in the case where it is tied to the transfer of an equity interest (transfer of shares or other ownership interest in an entity). Post-employment covenants not to compete and covenants not to compete entered into with nominal shareholders or parties receiving nominal consideration will generally not enforceable in California. Question: When should I allow the Buyer to perform due diligence? The timing of due diligence will vary in almost every transaction. Determining the scope and timing of the due diligence is important. Considerations include inconvenience to the Seller, cost to both Buyer and Seller and issues of confidentiality. As a practical matter, due diligence will often start after the letter of intent is signed and will run concurrently with the production of the acquisition documents. In order to protect Seller confidential information, Seller should be careful to not provide sensitive Seller information to Buyer until Seller is confident the transaction will close. Question: Should the Buyer be allowed to speak with Seller’s customers, suppliers and/or employees before closing? Question: Will I have to pay tax on money put into escrow before I actually receive it? If part of the purchase price is held back and put into an escrow, the escrowed funds will not be taxable to the Seller if the Seller does not have “constructive receipt.” The Seller will not be deemed to have constructive receipt if the Seller does not have access to (or any right to receive) the escrowed funds prior to the release date from escrow and the earnings in the escrow are not credited for the benefit of Seller. The “cap” is the monetary limit put on how much the buyer can recover from the seller in the case of a breach of a representation and warranty. The “cap” can vary generally from the full amount of the purchase price to as low as 20% of the purchase price. The “deductible” or “basket” is the cushion that the seller gets before the buyer can recover damages. If the “deductible” is $200,000, the buyer would have to incur damages in excess of that amount and would only be able to recover damage above that amount. In the case of a “basket” the buyer would be able to recover all damages from the first $ after total damages exceed $200,000. The deductible is generally 1% or less of the purchase price. The actual cap/deductible/basket amounts and limits are dependent on how competitive the buyer has to be to win the bid to acquire the seller. Question: Should I guarantee that the Buyer will have the absolute right to continue the use of Seller’s company name and product names? Many times, companies do not register their company names or product names. If the names are registered, however, registration alone does not guarantee the absolute right to use those names. Parties who have engaged in prior use of one or more of the names may have the right to the name and the Seller may not be aware of that right. Sellers need to be cautious in providing an absolute “bond” warranty that the Buyer will have the absolute right to the use of the names. The correct form of the representation and warranty by the Buyer needs to be carefully drafted in light of all the facts and circumstances. Question: How much detail should the letter of intent contain? Question: What precaution should Seller take if the Buyer is a newly formed entity? The concern regarding a newly formed shell entity Buyer generally focuses on Seller’s ability to get paid in the event of deferred purchase price such as receipt of a note or, in the case of other agreements where there would be future payment, such as the employment agreements that are a material part of the consideration. Sellers need to be more careful in making sure that deferred payments are properly secured in the case of a newly formed shell entity Buyer. shell entity Buyer. Question: Will the key employees who hold small amounts of stock be subject to the noncompete agreement? This is an issue that usually warrants a lot of attention by both Buyer and Seller. Special provisions generally will need to be made for key employees who are not receiving a substantial amount of the proceeds from the sale. These employees will need to make a living if they do not continue in the employ of Buyer or will need to receive severance payments or have some other arrangement that will not put them in a worse position after the sale than they were in before the sale. Question: If I buy all the company’s stock (instead of purchasing assets), can I hold each of the selling shareholders 100% liable for any future claims? Generally, a Buyer will want to have each of the shareholders be “jointly” and “severally” liable for any claims that the Buyer may have following the purchase. Selling shareholders, on the other hand, will not want to be liable for any greater amount than the proceeds actually received by them in the sale. As a matter of common law, if one shareholder is sued for the entire amount of the claim, that shareholder will have a right of claim against the other shareholders for their prorata contribution. In the case of smaller minority shareholders, Sellers will generally argue for “several” liability where each of the minority shareholders is only liable based on his percentage ownership. The largest shareholders will usually have joint and several liability where each of them can be sued by the Buyer for the full amount of the claim. The concern regarding a newly formed shell entity Buyer generally focuses on Seller’s ability to get paid in the event of deferred purchase price such as receipt of a note or, in the case of other agreements where there would be future payment, such as the employment agreements that are a material part of the consideration. Sellers need to be more careful in making sure that deferred payments are properly secured in the case of a newly formed shell entity Buyer. Question: What is a Section 338(h)(10) election? A purchaser may want to make a Section 338(h)(10) election if the purchaser buys the corporation’s stock, but wants to treat the transaction as a purchase of assets for tax purposes. Seller would generally object to this election and this treatment because Seller could incur double tax if Seller is a “C” corporation or in the case of an “S” corporation Seller could incur the additional taxes noted in question 21 above. The Section 338(h)(10) is only viable in very limited circumstances under existing tax law. Question: What is the normal time period between execution of a letter of intent and the closing? Factors that will affect timing include: (i) whether or not an audit will be performed (and will it be performed before or after the Closing); (ii) obtaining of third-party financing; (iii) obtaining third-party consents; (iv) any requirements for anti-trust filings (Hart-Scott-Rodino filing); (v) ability to complete due diligence; and timeliness of response by the other side. Depending upon the items that the Buyer may be willing to waive, a transaction can be completed within a week to two weeks; however, the normal time frame for closing from the date of the letter of intent is from one to two months. 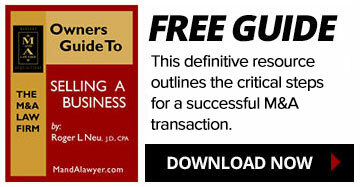 The timing of each transaction will vary, however, and these guidelines may not fit the facts of your transaction. Question: Why is the Buyer of my business offering me less if I sell my stock instead of selling Assets? There are generally two reasons that a Buyer may pay less in a stock purchase as compared to an asset purchase. In a stock purchase, Buyers may be concerned about potential undisclosed liabilities and problems that could lead to a reduction in price. Another reason is that Buyers of a “C” corporation will carry forward a contingent double tax obligation. That contingent tax problem arises if the Buyer later sells in a transaction structured as an asset sale where there could be a tax at the corporate level and again at the shareholder level. Question: Why is “debt” subtracted from the purchase price? Debt that is subtracted from the purchase price is generally referred to as interest-bearing debt and is generally bank debt. In addition, capital lease obligations may also be included as part of debt. In determining the purchase price, interest expense is generally added back to net profit. This add back of interest expense causes the purchase price to be higher as a result of multiplying the purchase multiple times a higher recast net profit. If the specified debt was not subtracted from the purchase price, Buyer would get the benefit of a higher purchase price, while at the same time not being responsible for payment of the debt. Question: Why is there a “working capital adjustment” built into the purchase price? The working capital adjustment is determined by subtracting current liabilities from current assets. When buyer submits its bid it will be based on seller having a specified net working capital amount at closing (the “Target”). If the net working capital at closing is greater than the Target then buyer will increase the purchase price by said difference and if net working capital is less than the target at closing, the purchase price will be reduced by said difference. The purpose for setting the Target is so that the company purchased by buyer at the closing has the same resources as the company had at the time the bid was submitted. These answers of frequently asked questions are provided for your reference but should not take the place of professional legal advice. To discuss your specific situation, feel free to contact us.